Claire van Kampen’s entertaining play about the bipolar 18th century Spanish king, Philippe V, and the castrato Farinelli whose heavenly tones helped restore the former’s sanity, serves as a worthy vehicle for the estimable Mark Rylance (husband of van Kampen), and the great countertenor Iestyn Davies (James Hall at some performances). Van Kampen demonstrates how the beleaguered king, seriously out of touch with reality (he’s trying to fish in a goldfish bowl in the opening scene) is hugely distressing his minister Don Sebastian De La Cuadra (Edward Peel), his physician Dr. Jose Cervi (Huss Garbiya), and his loving second wife Isabella (Melody Grove). It is she who hatches the plan of having the renowned singer take up residence in the palace to soothe her husband’s troubled mind, much to the consternation of Farinelli’s manager John Rich (Colin Hurley) who frets about Farinelli sabotaging his lucrative opera career. But the scheme indeed works and the king comes out of his depression, regains his senses and comes to rely completely on Farinelli whose castration at the tender age of 10 touches Philippe profoundly. Van Kampen’s language is, at times, quite colloquial, and “f” bombs abound, but somehow it doesn’t detract from the period ambience. The play premiered in 2015 at London’s Globe, and had a run in the West End, too. 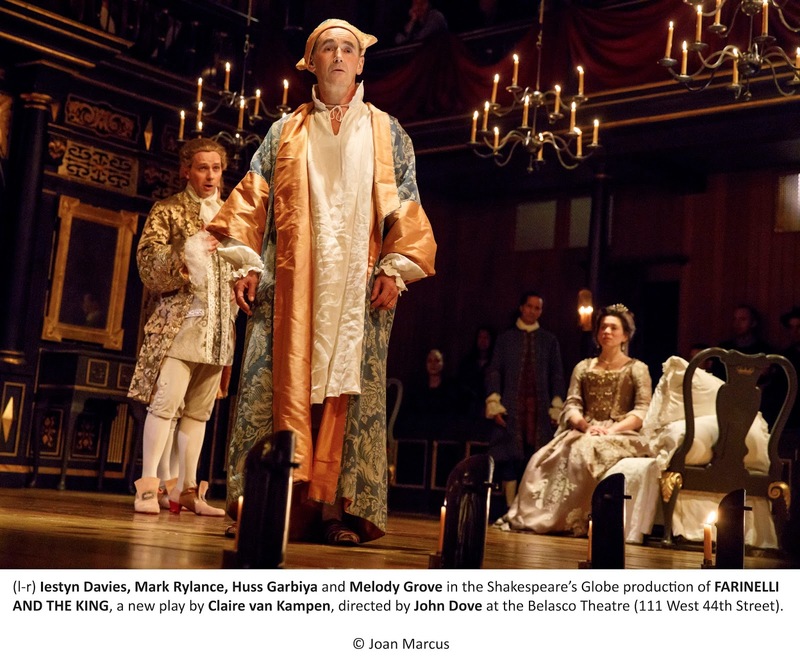 The production is beautifully staged by John Dove, and like Rylance’s 2013 productions of “Twelfth Night” and “Richard III” -- is here presented Globe-style, with some of the audience sitting on two tiers at the sides of the playing area. It is most atmospherically designed by Jonathan Fensom, lit only by candlelight. Rylance, of course, has a field day with his eccentric role, but the cast is uniformly good. 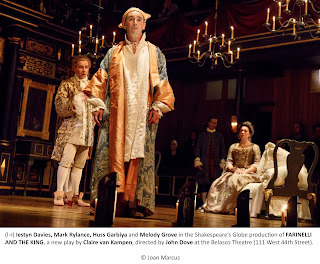 Farinelli is played by the excellent Sam Crane in the dramatic scenes, and when required to sing, Davies, identically dressed, steps forward and joins him on the stage, though not necessarily mirroring Crane’s movements. Crane, for his part, doesn’t lip-sync, but simply stands nearby in sympathetic attitude. 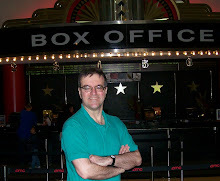 Grove is lovely as his ever-supportive wife. Peel is appropriately crotchety. The musical sequences are sublime -- with van Kampen serving as musical arranger -- and the seven onstage musicians earn a well-deserved hand at the end. One of the most magical sequences occurs in the second act when Farinelli insists they move to the forest to better appreciate the relationship of music to the planets, and the Belasco audience is addressed as if the townspeople who have appeared for the concert. Though perhaps not the very best of the British imports, the play rates nonetheless as a more than worthy addition to the Broadway season.